I am 38 weeks and 2 days pregnant today, which is just absolutely madness. A friend’s sister, who was due one week before me, had her baby a few nights ago, and even though I am very pregnant and living in a house full of baby things, it still boggles my mind that there could be a baby here at any moment. To look at me, it would appear that not much has happened in the last week or so. However, I feel like I am suddenly enormous. That pelvic pain I bragged about not yet experiencing in my previous post is here in full force, making my lower back and inner thighs feel like I’ve spent several days riding a galloping horse. I always thinking about food, but too full to eat anything. I am also totally exhausted. I haven’t officially started maternity leave from my PhD program, because I figure I might as well wait until the baby is born, considering I can very easily do my work from home, but my brain is basically already on a time out. It took me two full days to write an embarrassingly short project proposal, even though I able to crib most of the material from other things I’d already written. Luckily, I’d managed to get a lot done before I became useless because useless I most certainly am. However, what has been really interesting about doing this research while facing my own childbirth experience is discovering that as a pregnant woman, I will do anything to ensure my baby is healthy. I can intellectualize the medicalization of nature as a product of hospital care as much as I want, but I’ve learned that if a professional with an ultrasound wand tells me something might be wrong, I will drive home in hysterics and spend the next three hours on Google, working myself into a panic and vowing to consent to anything to make it better. Those aren’t two opposing thoughts – in fact, in most of the theory I’ve read, that’s how medicalization works. Doctors and hospitals apply techniques to make childbirth more efficient/more scheduled/ostensibly “safer,” and mothers trust their care providers and consent to them. It’s just been very eye-opening to experience it myself. For the first 32 weeks of the pregnancy, I saw the same midwife practicing out of a medical practice near my house. At each of my relatively rare and low-key visits, she would test my urine, take my blood pressure, and then do a fundal height measurement using a tape measure. For the uninitiated, the fundal height is the distance from the top of a pregnant woman’s uterus to her pubic bone. 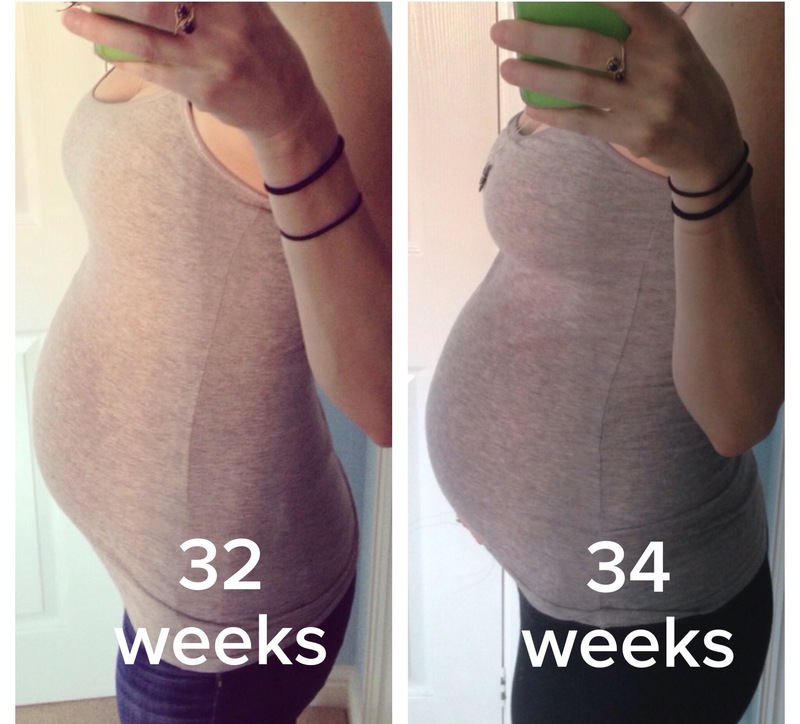 This measurement in centimeters should, conveniently, mirror the number of weeks pregnant a woman is – a woman who is 26 weeks pregnant should measure on (or around) 26 cm. At all of my appointments, I was measuring spot on. 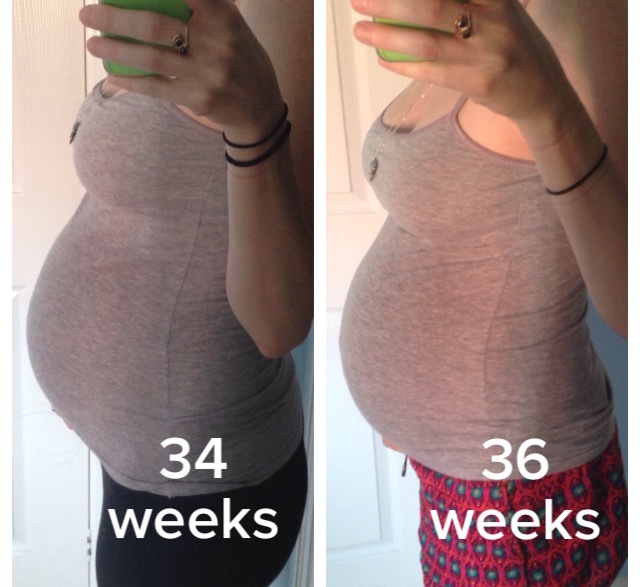 At 24 weeks, I was 24 cm. At 28 weeks, I was 27.75 cm. 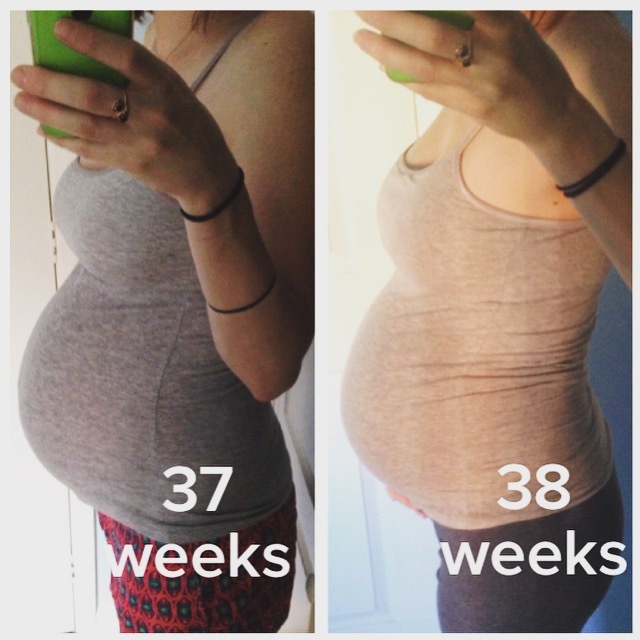 At 31 weeks, I was 31 cm. And then I moved to another city and had to transfer to another midwife. In the five days between my last appointment with my previous midwife and my first appointment with my new one, the baby turned from head-down to transverse, meaning he was now laying horizontally across my belly as opposed to vertically along it. I went from the long belly on the left to the short, stubby belly on the right. I didn’t think much of it, until the new midwife whipped out her tape measure and measured my nearly-32-week-belly at 27 cm. She immediately made me an appointment for a growth ultrasound, because measuring five weeks behind (even by super high-tech tape measure) could be a sign of a growth-restricted baby without enough amniotic fluid. Now, as a person who knows too much about pregnancy and childbirth due to having had my super dweeb face in journal articles and books for nearly a year, I completely flipped out. In addition to taking me out of a midwife’s low-risk care and placing me into higher-risk “consultant” (doctor) care, this new potential amniotic fluid issue put me at risk of being harangued into an induction, as fears about a baby’s size and amniotic fluid levels are one of the most common reasons labors are induced. Cue the crying in the car on the way home, the drinking of tons of liters of water a day in an attempt to up my fluid levels, and the crawling around on my hands and knees to try to turn the baby. A week and a half later, when I had the growth scan, the baby was head down again and measured in the 60th percentile for growth, which was lovely. However, the total amount of amniotic fluid measured via ultrasound was 8.2cm, which was still cause for alarm, as the “normal” range is about 8-18cm. I was hovering right at the low range of normal. My new hospital consultant wrote “low AF at 5% at USS” (low amniotic fluid at the 5th percentile at ultrasound) under a giant “ALERT! Please indicate risk:” label on the inside of my maternity notes, and told me she wanted me back for another scan in two weeks. That was great. Two panicky weeks later, at my second growth ultrasound, the amniotic fluid was up to 11.8cm, which was firmly normal. In addition, the baby now measured in the 90th percentile for growth. In fact, the ultrasound tech thought the baby might be growing too big – she took the femoral length measurement four times because she thought she was making mistakes. 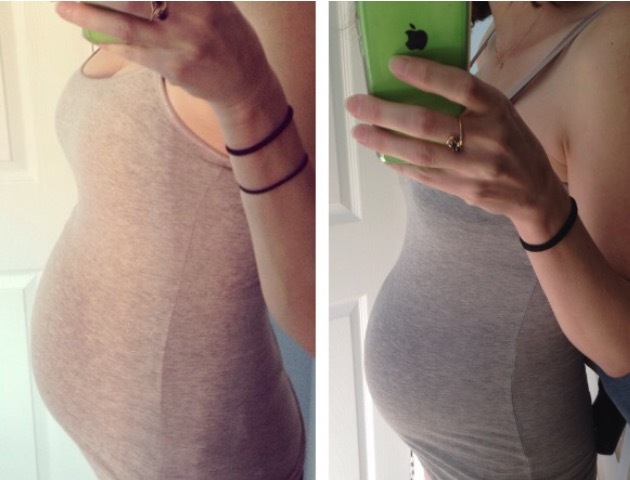 The baby that was once thought to be too small was now almost off the charts. Despite the incredible hulking baby, I passed the growth scan with flying colors and am no longer high risk. I hope it goes without saying that I am, of course, very happy and grateful that everything ended up being fine. It was, however, really bizarre to know that the difference in fundal height measurements between midwives was entirely due to the turning of the baby and the admittedly insanely subjective tape measure method, and still feel totally nuts when I was sent for extra ultrasounds. I thought that there was something horribly wrong with the pregnancy because of a tape measure. On one hand, it’s nice to know that the people taking care of us are proactive. I have had nothing but wonderful interactions with everyone, and I don’t think any of the extra tests were done to make me nervous or take advantage. However, on the other hand, it was unnerving to find myself ready and willing to submit to any intervention possible (I would have been completely on board with an elective c section, for example, if it meant combating growth restriction, which shocked me, given what I know about pre-term caesareans), when the methods pointing me in those directions should be approached with caution. The extra growth scans illuminated to me that childbirth interventions are notoriously difficult to manage and are more often than not used based on evidence that is subjective at best. For all the actual problems that are addressed by them, there are hundreds of others that are caused by them. (I lucked out because in my case, the only issues the extra scans caused were emotional.) At the risk of sounding super naive and having to eat these words after I have the baby, my WARNING ALERT SMALL BABY EXTRA SCAN experience has only solidified my desire to try to have as few interventions as possible during the birth. P.S. : I’ve been writing and editing this post for 24 hours and I still feel like it makes no sense. There was a point in here somewhere, guys, but like I said above, MY BRAIN IS ON VACATION AND I JUST CAN’T.